Osteoarthritis is a disorder affecting the joints of the skeleton, as it is a degenerative condition it is likely to worsen over time.There is a common myth surrounding osteoarthritis that it only affects the elderly when in fact it can be seen in those in early adulthood. It can occur as a result of wear and tear but also as a consequence of an injury. The condition arises as the cartilage in the joints, which is the substance that covers and protects the surfaces of the joints, becomes worn or damaged. AS this happens the normal fluids around the joint can become depleted. When these two factors occur the person can feel pain as the joint becomes compressed and the bony surfaces come into closer contact. The most common symptom is pain at the site of the arthritis. The pain is usually chronic and can be either a constant ache or quite a sharp and more severe occurrence.The joints can sometimes be heard to ‘crack’ when moved even slightly and fluids can accumulate around the joint especially if it is affecting the knee joint. The joint s affected can include but are not limited to the knees, fingers, wrists, hips and spine though it can affect any joint in the body. The affected joints often become stiff and increasingly immobile as the condition progresses. 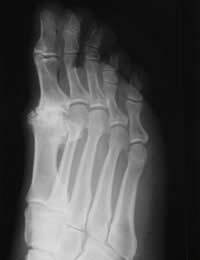 In some cases, especially when the smaller joints such as in the foot are affected, the joint may become disfigured, for example a bunion may form. Osteoarthritis is usually diagnosed after the person has presented with pain. The doctor will normally carry out an examination of the affected area and discuss the problem thoroughly with you.Following this an X-ray or other scanning technique such as an MRI scan will probably be order in order to visualise the joint. These images will show up any decrease in fluid around the joint and also if there are any bone-spurs formed which can happen as a result of the damage to the joint. Unfortunately it is difficult to assess if the condition is likely to occur or when it is in its early stages so the complaint will normally have developed quite significantly when the diagnosis is made. As the condition is progressive and is usually well established upon diagnosis there is no cure for the problem but the symptoms can be treated so they have less impact on daily living.Pain relief is usually the first line of treatment and this can usually be achieved by applying either a heated or cold compress to the area. This will reduce swelling and allow for more movement. As the pain experienced may be long term the use of pain relieving drugs should be minimised and only used when the ;pain is exceptional .It is recommended that other forms of pain relief are sought to begin with such as relaxation, massage, pain management classes or by using devices that will help to relieve the pressure on the joints. Rest is very important and relieving the pressure on the affected joints. It is recommended that when possible take the weight off the joint.Once the swelling and pain have decreased it will be very beneficial to participate in some form of exercise even if this is a simple brisk walk daily. Not only will this keep the joints mobile but it may help to lose some extra weight that can put additional pressure on the joints. In the case of severe joint debilitation and when there is severe and uncontrollable pain, your doctor may refer you to an orthopaedic surgeon who will assess whether a joint replacement is an option. Not all joints can be replaced and they are not normally indicated for use in the young unless there are exceptional circumstances. If the osteoarthritis has caused a disfigurement of the joint like a bunion, surgery may be indicated to correct the deformity. Unfortunately osteoarthritis is not a curable condition. The symptoms of the condition may be addressed but the individual will be unable to prevent it spreading to other joints in most cases.It is a progressive illness and develops slowly over time. From what I have read above, I am suffering from Osteoarthritis, all the signs and symptoms you have described fits the description of how I feel.I would like to ask if this condition is associated with Gout? This is because after eating "red meat" I experience very strong pains on my knees with swelling around them.I would be very greatful to hear from you.